WITH Duke's Lock (19) open to the public whilst being repaired, plenty of items have come to light. 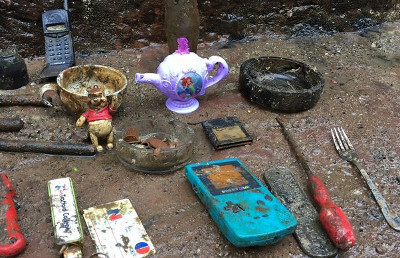 These include mobile phones, unusual pottery, tools and cutlery together with a coin from 1919 that are being put on show so the public can see how easy it is to lose things in the canal, Alan Tilbury reports. The lock and adjoining pound have been drained for urgent repairs to the lock, with it being 'open' to the public to venture down over the weekend and see for themselves how it operated, with Canal & River Trust staff on hand to answer questions. Such was the amount of silt and rubbish in that section of the waterway that the trust state that 42 tonnes had been removed, that will surely make it easier going for boaters over that particular part of the 'Nine'.